When my wife and I were considering getting a new house, something we wish we knew was the dangers of ambient EMF radiation. 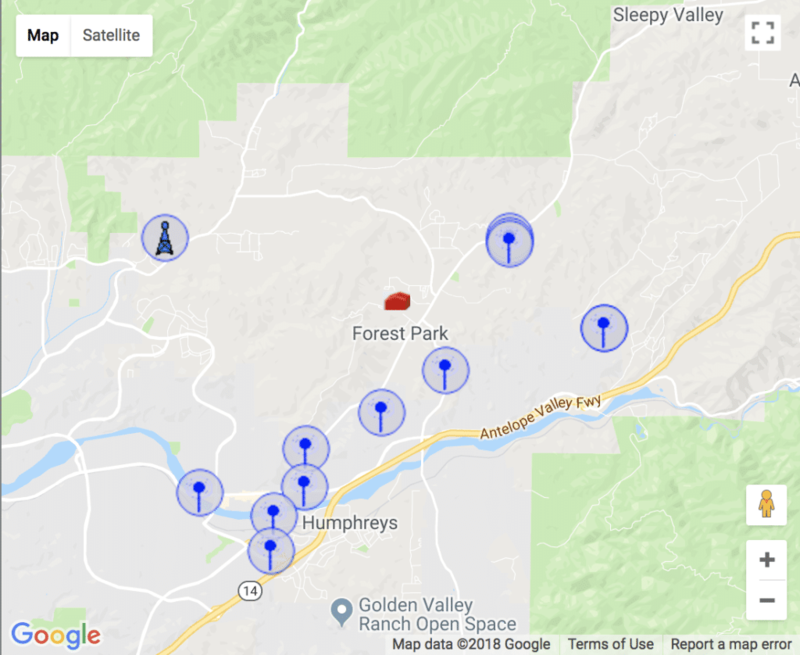 I won’t go into much detail on this, as I wrote a whole post on finding a low EMF house, but suffice it to say that one of the most important things to know is the location of nearby cell towers. If you want to skip straight to the illustrated how-to guide, just click HERE and it’ll jump you right down! First let’s talk a little bit about why you should care where cell towers are, then we’ll look at a few of the common types, and finally, I’ll walk you through exactly how to see a map of cell towers near your home. Why Would You Want To Know Where Cell Towers Are? Even looking back 50 years, the amount of ambient EMF radiation we are exposed to today, compared to then, is estimated at 100 million times greater. This is largely attributable to the proliferation of cell towers all around us, especially in highly populated areas. With the introduction of 5G, this will likely be far worse as this network will require millions of new small and large antennae and towers to support the speed and efficiency promised. Cell towers, small or large, emit high amounts of radio frequency radiation that can be measured as far as 50 miles away. This EMF radiation has been linked to a plethora of long-term health issues, as well as immediate symptoms. Take a look at the image below. This chart was created based on a study completed in France where individuals who lived in close proximity to a cell phone tower were polled about new or worsening symptoms. You can see how much worse these symptoms were for individuals living in close proximity to the tower. For a much more in-depth look at the health issues with EMF radiation and common symptoms, check out other posts on the Knowledge page, or read my post on EMF radiation symptoms. There are tons of different structures and systems that are in the realm of “cell towers” (or sometimes referred to as cell sites, or cell phone base stations). Nearly all of these different structures push an enormous amount of EMF radiation in the form of cell signal, WiFi, 802.11, and many other communication systems. Lattice Towers – Sometimes referred to as a self-supporting tower, lattice towers are very tall steel structures and are the most powerful of the cell phone towers. With a range of about 2-50 miles depending on terrain, lattice towers push an enormous amount of EMF radiation via cell signal to customers. Monopole Tower – A relatively simple tower, containing a single mast, these are typically around 100-150 feet tall and have simple antennae on top. These are common where space is limited since they require very little property to be erected. Guyed Towers – Similar to monopole towers in that they are steel structures with a single mast. However, guyed towers use guy wires to give it more stability. These require more ground but are more stable than monopole towers and cheaper to build. You can see guyed towers sometimes over 350 feet. Stealth Towers – I have some of these towers near me. Some zoning codes require that cellphone providers mask there towers to make them less noticeable, and often smaller. You will sometimes see these disguised as trees or other objects to blend into their surroundings. There is a fantastic resource out there for seeing a map, like the one to the right, of ALL the cell towers that are near any address. The really special thing about this website is that it not only gives you a detailed map of all the towers, but it gives you much more information. 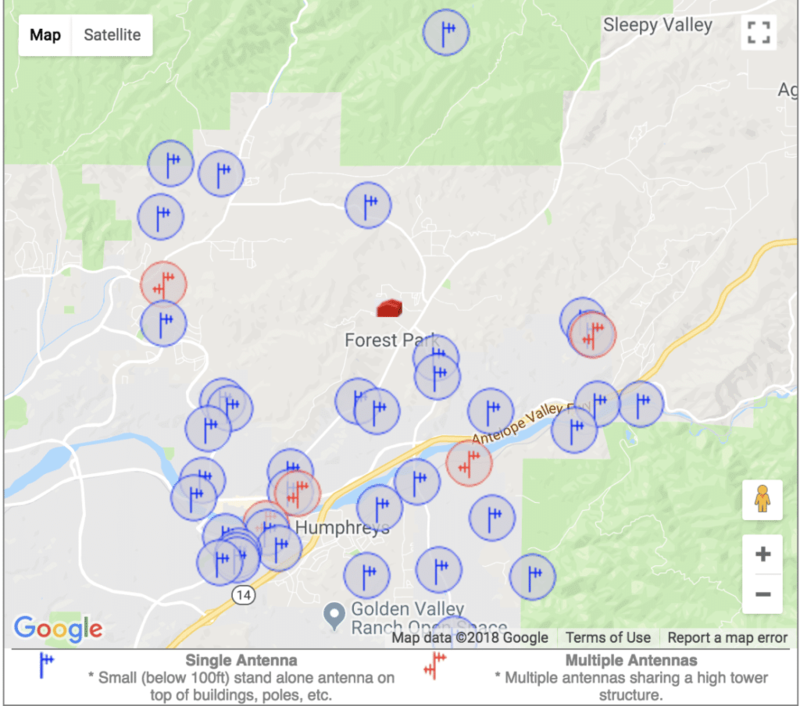 There are a few other resources out there that will provide you with a simple map of the FCC registered towers (the primary ones supplying the cell signal and internet to your phone). These websites usually don’t show you all the other cell towers that are used for other communication purposes, and still, emit radiation. On top of this, Atennasearch will show you a map, and detailed list of all the antenna in your area. This is important because this is the other part of the infrastructure that maintains cell signal and other communication systems beyond the primary cell towers. Ok, now let’s walk through step by step how to get a cell tower map in front of you, and then we’ll talk about some of the other detail you can look at. Once you’re there, you’ll see the following box, go ahead and enter in all the information of the address you want to see and select “Go”. Next, you’ll likely be asked to confirm your address to make sure it’s what you’re looking for. Sometimes you’ll be asked if you just want to see the city or state that you’re looking for. Once you’ve confirmed that the address is correct, go ahead and hit “Process”. You’ll then be confronted with a screen that looks something like this, telling you how many cell towers, new towers, and antenna can be found within a 4 mile radius. Now you’ll see a map like the one below, of all the cell towers in the area. Use this key or the one you’ll see below the map, to better understand the different tower types you are seeing. The little red house you see on the map is the address that you put in. Underneath the map, you’ll see a few things. First, if there is a high amount of cell towers near your address, you’ll see some alerts and some explanations of those alerts. 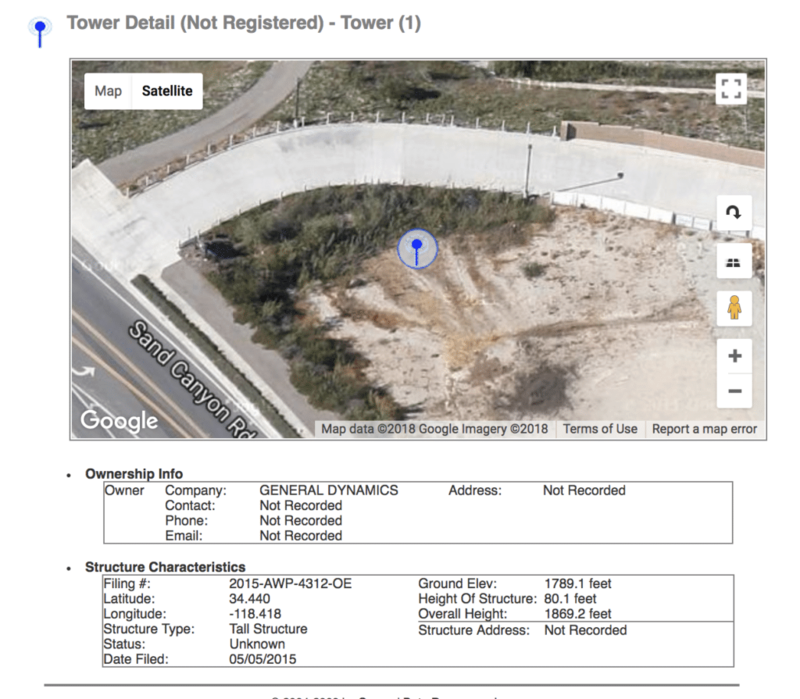 You’ll also be alerted if there are new towers being built near your address. Underneath this is the coolest part. 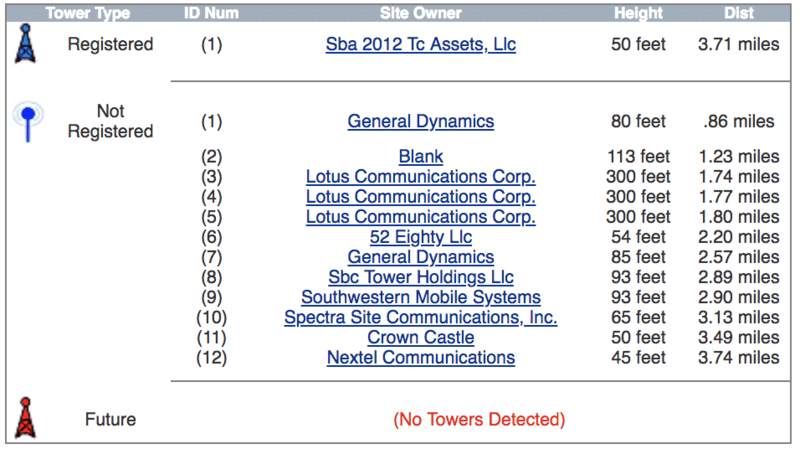 You’ll see a full list of every registered tower, non-registered tower, and future tower. You’ll be given the exact height of each cell tower and the exact distance from the address you gave. For each of these towers, you can click on its name to see an exact location, as well as all kinds of information about that tower. To be honest, when I first found this resource, I had an absolute blast looking at all the information that was provided, it’s pretty astounding! This is extremely helpful if you’re trying to find a low EMF home, trying to calculate how good cell reception will be in a given home, or for just general curiosity. Now let’s take a quick look at how to see a map of all the antenna in your area. If you can’t get back to this window, just head back to https://www.antennasearch.com/ (opens in new tab) and start from the beginning until you get here. 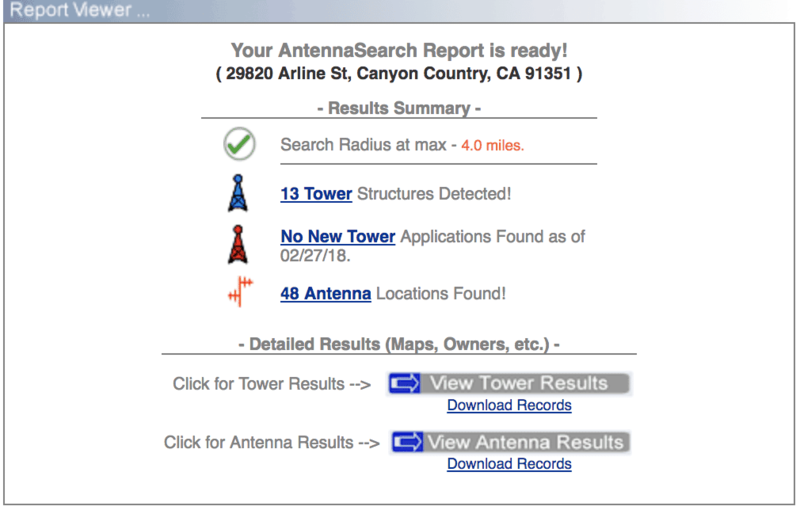 So now, we’re going to select the “View Antenna Results” instead of the tower results. So, first of all, what are cell antenna? These antennae are what actual emit the signal for cellular services, paging, radio services and much more. Antennas can be placed on the towers themselves, or as stand-alone units on buildings, the sides of condos, apartments, churches, light poles and many other places. Some stand-alone antenna are very small and camouflaged and you are unlikely to even know they are there. This is why a map like this can be so helpful, to find all of those EMF radiation emitting antennae that you didn’t even know were there. The antenna map works almost identical to the cell tower map. You’ll see a map of all the single, and multiple branch antenna near your address, like the map below. The single antennae are stand-alone structures and are usually attached to some other building. The multiple antennas usually share a single large tower. Just like the cell tower map, you can also see details about every single antenna, including it’s distance, height, and who owns and operates it! Well, there we have it, an illustrated guide to seeing every cell tower and antenna near you! I truly hope you found my article “Cell Tower Map – An Illustrated How-To” helpful, if so, please consider sharing!